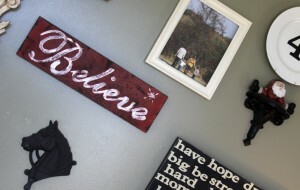 I wanted to share with you one more DIY sign before the holidays arrive. 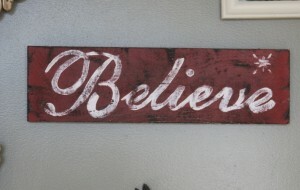 This Charming little Believe sign is hand painted and distressed to look old and weathered. It’s easy to make new signs that look old – they have great character and add a special touch to your holiday decor. This time of the year helps us all to believe in the magic of Christmas. I made this sign special to add to our gallery wall for the holidays. 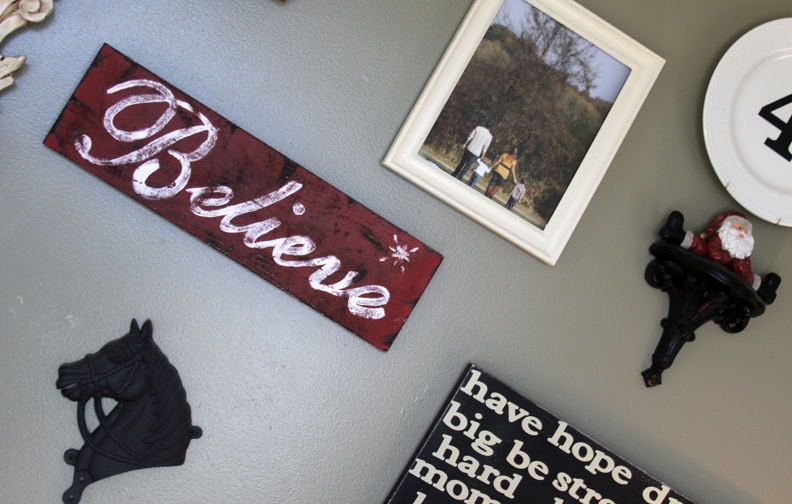 It was fun to add a little bright red to the wall and make it a little bit Christmasy without going overboard. This sign was made in the exact same manner as my sleigh ride sign (and at the same time to be exact). The only difference is the font that I choose, the size of the board, and the amount of distressing that I did to it. Here is the basic run down of how I made the sign – you can check out my vintage looking sleigh ride sign for more in depth instructions. I found a scrap piece of wood that measured 19 inches long by 5 1/2 inches tall. The board is 1 inch thick. I painted it using two layers of black spray paint, followed by two layers of red spray paint. Once dry I painted the letters on the front. I used the font English111 Vivance Bt in bold from Microsoft word to create my template. I used the same technique as the sleigh ride sign by laying my printed letters over the sign and tracing them with a ball point pen. I then free hand painted in the letters transferred onto the sign using a white acrylic paint. I added a little free hand star in the upper right hand corner and was all finished. I used an electric sander to make my sign look nice and weathered. 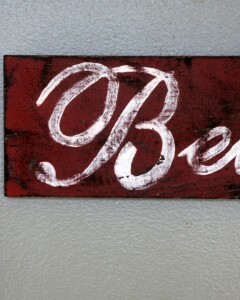 I sealed the sign using a matte lacquer spray. I love the way the black looks showing through the bright red paint. I added pop can tops with hot glue to the back to hang my sign from. 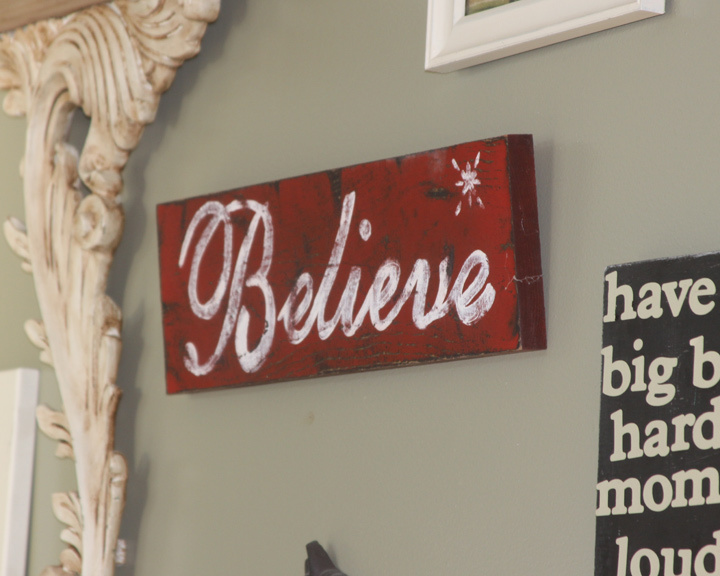 I think it looks perfect on the gallery wall and is a great reminder to believe in all of all the magic that this time of the year has to offer.